Does everybody remember that Ninjas vs. Pirates debate a few years ago? During that whole ordeal, I never took sides. 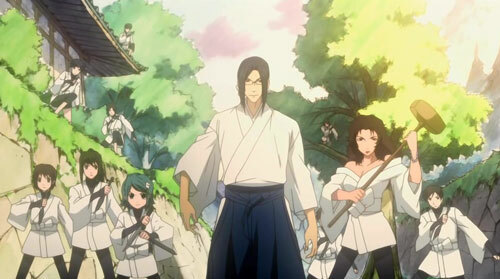 But now that I’ve watched Nabari no Ou, I’ve decided I would definitely side with the Ninjas. In this anime of love (the… strange kind), betrayal, and apathy, Miharu Rokujou (Brina Palencia) must discover just what it means to be a ninja and follow the path. In a war of ancient ninjas and the pervasion of the modern world, the Shinobi of the old ways must fight for a future which still finds ninjas to be relevant. And this is decided through the power of the Shinrabansho. understanding what’s going on or why this man was attacking him, Miharu is saved at the last minute by one of his other teachers, Tobari Kumohira (Eric Vale). Hearing the word Shinrabansho and not fully understanding, Miharu is thrown into a dreamlike state in which a “fairy” speaks to him about his inner power. Meanwhile, outside, Tobari-sensei seals this hidden power inside Miharu, protecting him for a time from himself. 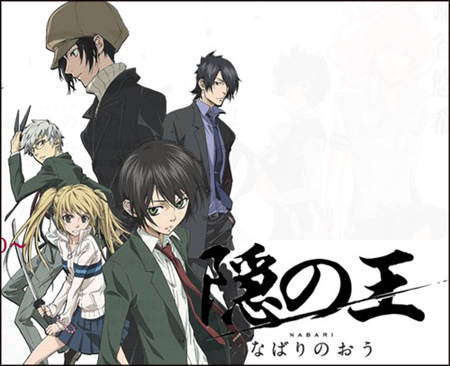 With the conclusion of this night fight, Miharu is from now on protected by Tobari and two of his classmates, Kouichi Aizawa (Chris Burnett) and Raimei Shimizu (Kate Oxley). With their help and the guidance of the Fuuma village ninjas, Miharu and his friends must find the forbidden secret arts of each ninja clan and use them in order to extract or use Miharu’s Shinrabansho. With a surprising ending and quite a few turns or loyalty, this show really delves into what it means to trust and believe. The power of the Shinrabansho! I really liked the fluidity of the fight scenes and the use of ninja arts in this show. This is coming from someone who just recently got into Naruto, the slightly retarded, childish version of Nabari without a whole lot of plot. (Well, I like it though…) With every character skinny as a pole, it’s almost easy to believe the gymnast like moves of these stylishly dressed ninjas. I was a big fan of the fact that not every character in this show was a ninja though. 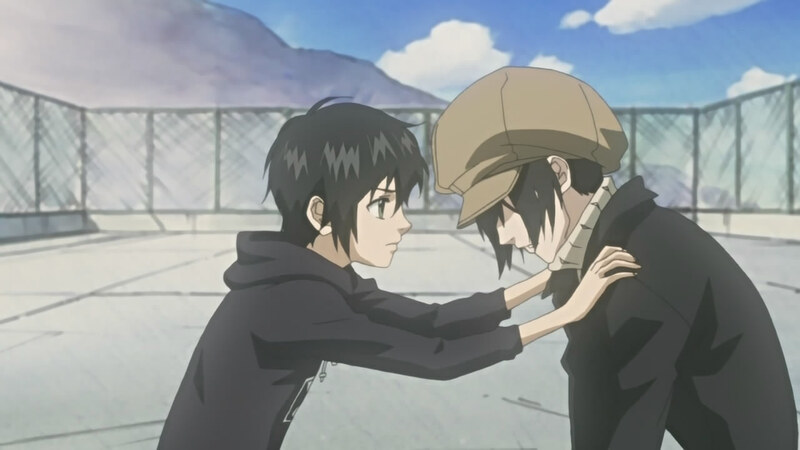 Yes, it’s hard to think that Miharu never really fights (a hard thing for me to get over when it comes to protagonists), but he makes it for it with his wiles. 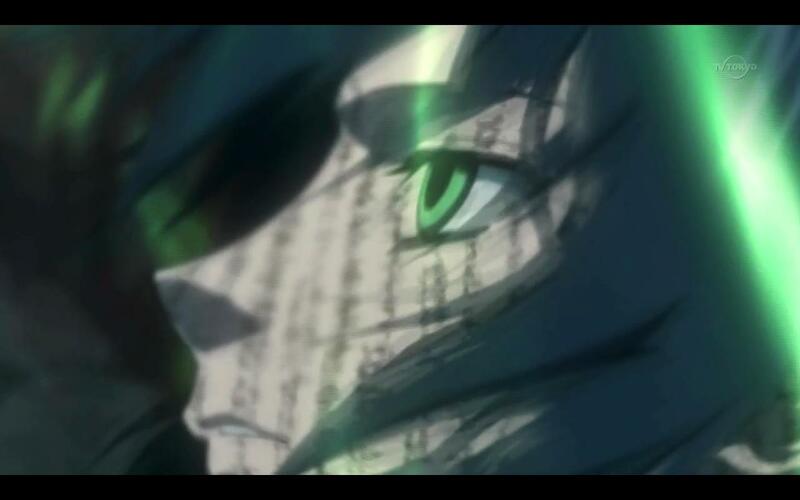 What’s great is the samurais, Raimei and her badass bro, Reiko Shimizu (J. Michael Tatum). He’s said to have killed every member of the Shimizu family, by himself, when he was very young. Can’t get more destructive than that. As with most shounen I’ve been watching, there’s a focus on an overarching plot with little sections running throughout, resulting in the product of the ending. I’m not opposed to this structure, but, coming from a movie lover, it’s slightly difficult in getting over a show that doesn’t trudge ahead by sticking to one linear plot. But I digress. There are a bevy of interesting characters in this show that really stand out to me. I would say Yoite (Joel McDonald) is the strongest of the crew. In what seems to be an antagonist role, Yoite slowly becomes an emotional character that lots of other characters begin to put stock in. In the end, Yoite becomes somebody that changes the face of all those involved, whether they realize it or not. Shifting focus between characters is an interesting tactic in plots, and this was pulled off well. The Fuuma clan, ready to fight. With a more artistic, flowing feel, I found Nobari no Ou to be a compelling and interesting take on what it means to be a shounen about the popular topic of ninjas. From a emotional standpoint, the focus on characters rather than action is commendable. The use of powers and ninja arts is almost poetic in their symbolism and stand out in comparison to the actual weapons used. Not a bad voice acting crew with a lot of notable names, it is a decent body of work. Enjoy the boy on boy love too! (Not exactly, but you’ll see what I mean.) 7.1 out of 10. A little bit of that boy love for ya. 1 Comment	| tags: ancient ninjas, apathetic nature, apathy, artistic feel, boy on boy love, Brina Palencia, caring nature, character driven, Chris Burnett, emotional shounen, Eric Vale, fluid fight scenes, forbidden secret arts, Fuuma clan, hidden power, inner power, interesting characters, J. Michael Tatum, Joel McDonald, Kate Oxley, Kouichi Aizawa, love and betrayal, Miharu Rokujou, Nabari no Ou, Naruto, ninja arts, ninjas, Ninjas vs Pirates, no connections to other characters, no linear plot, overarching plot, Raimei Shimizu, Reiko Shimizu, samurais, sealing powers, Shinrabansho, shuriken, sins of his past, symbolistic, Tobari Kumohira, turns of loyalty, village ninjas, Yoite	| posted in Anime/ T.V.